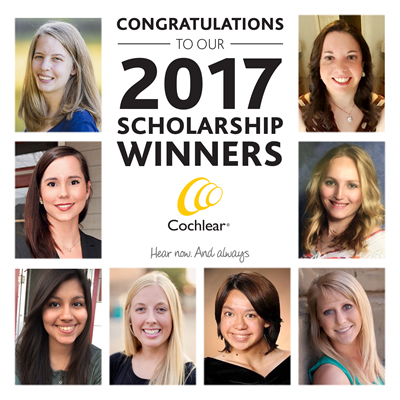 The eight winners of Cochlear’s prestigious scholarships have been honored on February 19 at Cochlear Celebration, the biggest event dedicated to recipients from across the U.S. and Canada. The 15th annual Graeme Clark and the sixth annual Anders Tjellström scholarships recognize values like leadership, humanity and academic achievement in students who are Cochlear™ Nucleus® Implant and Baha® System recipients. Each of the eight students will receive $2,000 per year for up to four years at an accredited college or university, for a total of $8,000 per student. Since 2002, Cochlear has awarded $568,000 to 80 college students. The scholarships are named after Graeme Clark, the pioneer of the multichannel cochlea implant, and Anders Tjellström, surgeon and the founding father of the Baha treatment. The Graeme Clark scholarship is an award open to Nucleus Cochlear Implant recipients around the world. The Anders Tjellström Scholarship is an award open to Baha system recipients in the United States and Canada.